Listen to Let Us Be Merry while viewing the perusal score: . Let Us Be Merry is a charming a cappella setting of William Billing’s Judea (from The Singing Master’s Assistant, published 1778 in Boston). 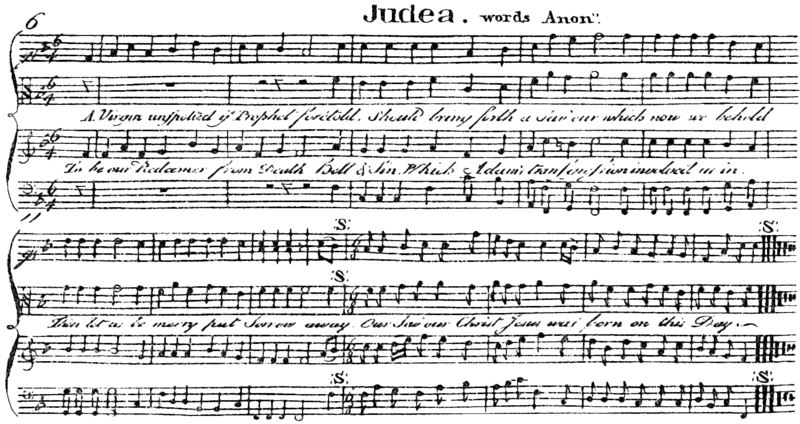 A facsimile of William Billings’ Judea as published in The Singing Master’s Assistant, published in 1778 in Boston. This version tells the Christmas story in three verses, taken from eight verses found in most versions of this hymn. For Caesar commanded the same should be so. Then learn we from hence, hautry pride fro to shun. The Great God of mercy, of peace, and of love. To help choirs prepare, here are several recordings of Let Us Be Merry. Please note that your director will likely choose different tempos, and conduct tempo changes differently than on these recordings. These recordings are not authoritative, but rather are a useful aid for learning notes and for getting a feel for the piece. As always, keep one eye up and follow your director! Note that in some of these recordings (i.e. the Soprano only, Alto only, etc. ), long rests are shortened to about 3 seconds. Also, these recordings are of the most recent revision of this piece (currently D6–look in the lower corner of any page with music and you will see which edition your music is).